Queensland Cadets Flying High… Again! The weather smiled brightly on cadets of Queensland Group, joined again by the Federal Air Activities Commissioner Cameron Shaw, while attending their annual Group Gliding Camp in Gympie recently. 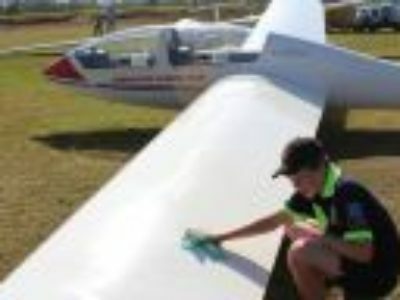 Held for over a decade with the assistance of Gympie Gliding Club, cadets and officers were camped directly adjacent Gympie Airfield for the entire weekend. In addition to the core camp program of gliding theory and airtime, this year attendees also participated in composite sections in an informal freestyle precision drill competition and in a series of DropZone exercises. A Queensland Group activity, DropZone is a hands-on course of challenges and scenarios designed to foster and test initiative, leadership and teamwork; while integrating communication & skill development and having fun. Logistics of the camp were enhanced by new equipment, including chairs and tables made available through GCBF and Volunteer Grants, so that all could enjoy the legendary catering of Gp Comr Christine Burgess and her team in single sittings. With multiple gliders in service and fine weather, it proved to be another efficient and engaging gliding event packed with many great opportunities to establish or reinforce fellowship & friendships across the entire Queensland contingent.